The Grammy-winning superstar performs at London’s Royal Albert Hall with the Black Eyed Peas and friends. Blending the boundaries between hip-hop, pop, electronic dance music and contemporary R&B in his signature musical style, will.i.am performs from London’s Royal Albert Hall in will.i.am and Friends Featuring the Black Eyed Peas - Landmarks Live in Concert: A Great Performances Special, premiering Friday, April 20 at 10 p.m. on WXXI-TV. The Grammy-, Emmy- and Latin Grammy-winning artist, writer and producer reunites with Taboo and apl.de.ap of the Black Eyed Peas on stage to perform reinvented renditions of hits including “Let’s Get It Started,” “Where Is The Love?” and “I Gotta Feeling.” Special guests Eva Simons, Pia Mia and Lydia Lucy (The Voice UK) join will.i.am for dynamic performances of “Scream & Shout,” “#thatPower,” “Heartbreaker” and more in this one-night-only concert experience. 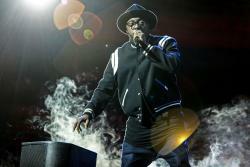 will.i.am chose his second hometown of London for this special event.